What Are the Differences Between Types of Hydrangeas? 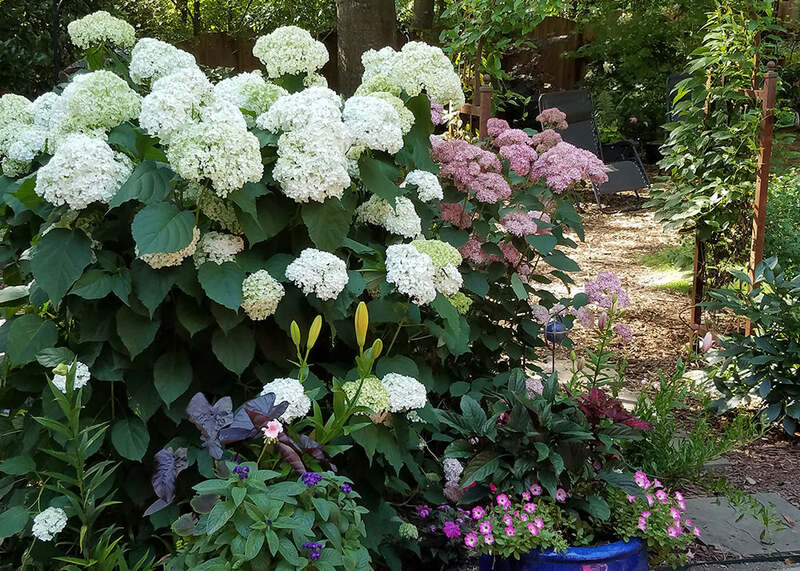 Experts say there are at least 25 different species of hydrangeas and some say as many as 80, but for the average gardener there are 6 that are the most popular. Each species has different cultural requirements but no matter your garden or garden style there is a hydrangea for you! We have hydrangeas for sun or shade, zone 3 to zone 9 hardiness, native or non-native, etc. Hydrangea anomala, also known as climbing hydrangea, is actually a vine and climbs trees and buildings or other structures by twining and aerial rootlets along the stems. It does not hurt the tree or building, but make sure if you are using a tree to support this vine, that it is a mature tree with a large trunk. This vine can be slow to establish, but then it can take off. I have heard it said that the first year it sleeps, the second year it creeps and the third year it leaps! So don’t despair if your newly planted climbing hydrangea takes some time to get established. Climbing hydrangeas produce white lacecap flowers in May and June. The vines do have nice exfoliating reddish brown bark in winter so it does offer seasonal interest. Once these vines are established they send out lateral branches from the main stem which gives it a tiered effect. Climbing hydrangeas prefer partial shade. 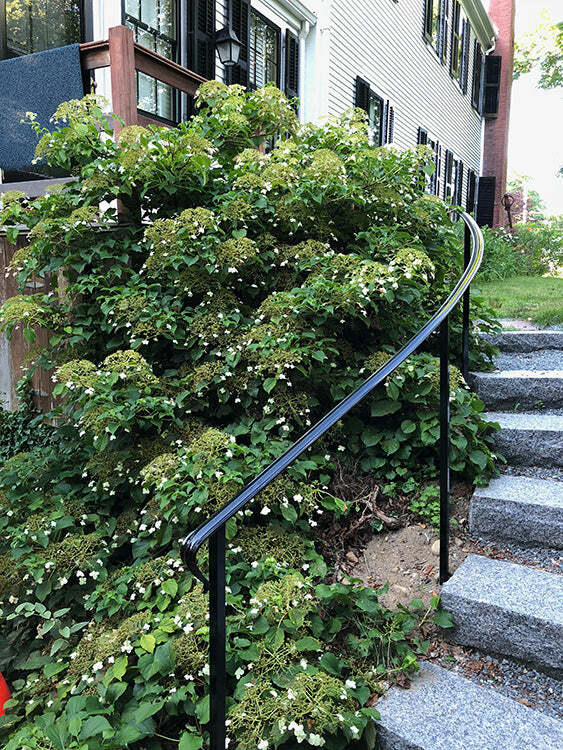 This climbing hydrangea is sprawling up an embankment, rather than a tree. Hydrangea arborescens is called smooth or Annabelle hydrangea. Annabelle is actually a cultivar but it’s so common that its name is used interchangeably with arborescens. For those of you who like to plant native species you should consider this hydrangea. It’s actually native to the Eastern U.S.
Arborescens are one of the first hydrangeas to bloom in the spring/early summer and they bloom on new wood. This takes the guess work out of pruning! Just when I start getting spring fever in late winter I can get out in the garden to cut these down to around to 12 to 15 inches and have gorgeous blooms for early summer. I don’t even have to worry about a late freeze! Most arborescens flowers are cream color but within the last 10 years pink cultivars have been introduced. They come in both mophead and lacecap forms. If you love pink like me but do not want to mess with macrophyllas and soil amendments to get your pink flowers, this one is always pink! I have my arborescens around my patio where they get plenty of morning sun and shade in the hottest part of the day (late afternoon). They are real show stoppers when they are in bloom. Read our blog post detailing Hydrangea arborescens, The Wild, Smooth, American Hydrangea. This picture shows both a white flower and a pink flower type of smooth hydrangea. Hydrangea macrophylla is the beauty queen of the hydrangea world. This hydrangea is sometimes called Big Leaf, French, or Mophead hydrangeas. When someone mentions hydrangeas, this is probably what comes to mind. These beauties have two flower types: mophead or lacecap. The mophead has large globe-shaped flower heads. The flowers of the lacecap have a flattened head of small flowers in the center surrounded by larger sterile florets. The flowers on most macrophyllas can be changed from blue/purple to pink based on the soil pH. Acid soil produces blue/purple flowers and alkaline soil will produce pink blooms. There are some white macrophyllas that are not affected by soil pH and do not change colors, but some tint blue or pink depending on the soil pH. Another blog post explains pH and how it changes hydrangea flower color. I am partial to pink blooms but here in Georgia with clay soil (acid) blue flowers are the norm. Usually the first year I plant my beautiful pink hydrangea it will be pink but by the next year when the roots have interacted with the native soil, I will have blue flowers. Many of the older macrophylla varieties bloom on old wood but the newer varieties bloom on old AND new wood. With these remontant varieties (fancy word for re-blooming) you get a longer show of flowers for the season. Also, if you get a late freeze after a long warm up period that freezes the buds you will still get some blooms later in the season on the new wood. You don’t want to place these beauties in dense shade or you will have fewer flowers. In my garden, the hydrangeas that get direct morning sun (4 hours) have far more flowers than those that are shaded under a canopy of trees. Tip: If you're having trouble with getting yours to flower, read my article on "Why is My Hydrangea Not Blooming" for information about how to fix that. If you didn’t think you could grow hydrangeas because you don’t have shade, I have good news. Paniculatas thrive on sun! Paniculatas bloom mid summer and have the same creamy, panicle-shaped blooms as the oakleafs. These large blooms also can age to a nice rosy pink so they give you an extended bloom period. Paniculatas bloom on new wood so in late winter or early spring cut these shrubs back to 1 to 3 feet (for taller plant). No need to worry about late freezes or pruning quandaries with this species. These plants can get quite large (8 feet or more) and make a real statement if you see them as a hedge. They do have dwarf varieties so make sure you are picking one that fits your space. I have different varieties in my yard and they are not fussy, but they do need plenty of sun to do well. I have found that the paniculatas in my yard are pollinator magnets. All sorts of pollinators and butterflies visit my shrubs. 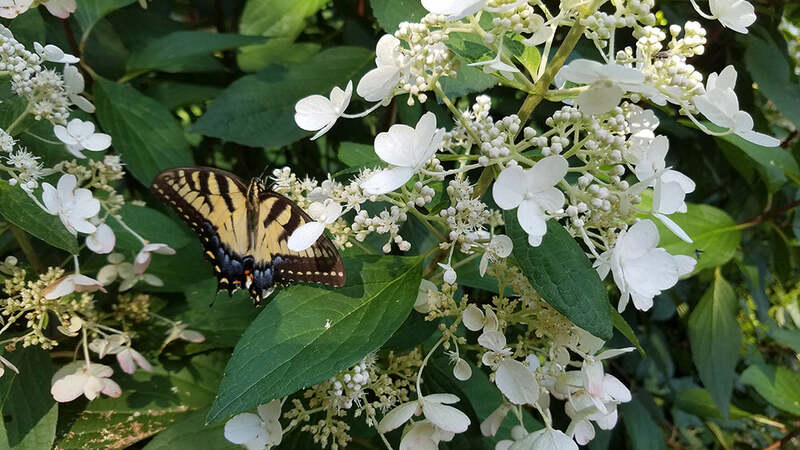 A butterfly on my panicle hydrangea. Hydrangea quercifolia is commonly known as oakleaf hydrangea because the shape of its leaves resemble an oak tree leaf. Oakleafs are also native to the southeastern United States. If I had to choose a hydrangea that had 4 seasons of interest it would be the oakleaf. Its cream colored bloom in the spring can turn rosy colored in summer. The leaves have beautiful burgundy fall color and the bark is peeling in the winter. Oakleafs come in all sizes but the larger cultivars can get quite large over time so make sure to give them plenty of room to do their thing. I have oakleaf hydrangeas behind my perennial border and they provide a nice back drop with their large deep green leaves and large panicle shaped flowers in spring. Oakleafs can tolerate more sun and drier conditions than the macrophylla. They do not require pruning but if you prune to reduce size you need to know they do bloom on old wood so make sure you prune before August 1 so you have flowers next year. They are one of the more carefree hydrangeas to grow if you are a hands off gardener! Read further details about Hydrangea quercifolia - Stately King of Hydrangeas. 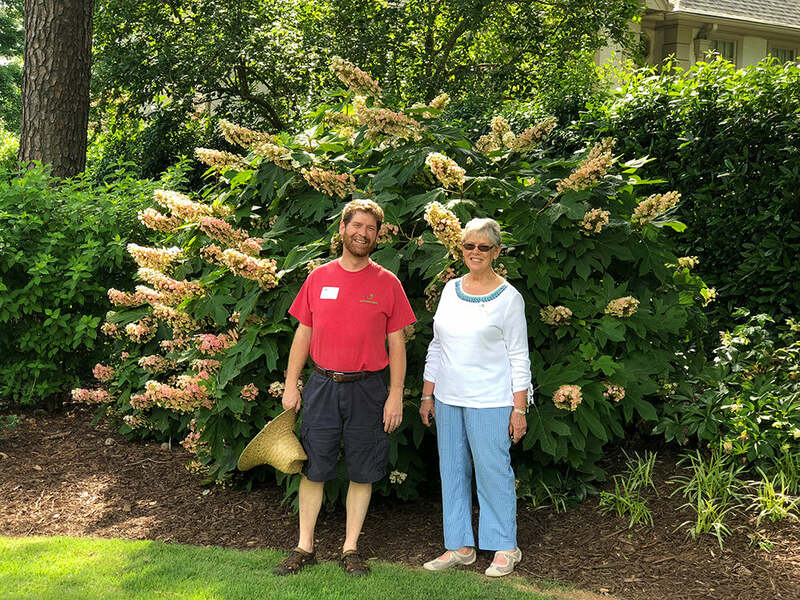 Mike and his mom in front of an oakleaf hydrangea. Hydrangea serrata, also called mountain hydrangeas, can be mistaken for a lacecap macrophylla hydrangea. Many times these get lumped together. There are however some key differences between the serrata and the lacecap forms of macrophylla. Mountain hydrangeas have smaller leaves and flowers than most macrophyllas. Although the flowers are smaller and more delicate looking, the quantity of blooms on the serrata is much greater. Like the macrophyllas, the color of the blooms is affected by pH of the soil. They do have the same cultural requirements as the big leaf hydrangeas. Serratas are native to the mountains of Japan and Korea. Serratas do have better cold tolerance than macrophyllas so they are less affected by late freezes and still will bloom reliably. Most bloom on old wood and should require little pruning. If you have to prune, it’s best to do it after they finish blooming. There are some newer cultivars that bloom on old and new wood. Read more about Hydrangea serrata: Hydrangea serrata, Commonly Called Mountain Hydrangea. After reading about each of these species, I hope you have been thinking of adding a new species you don’t currently grow to your garden. A combination of all these will add to the diversity of your garden and give you added interest for each season. If you are like me and have some of each already, there are plenty of new cultivars to try! Mariana is a Master Gardener from Cherokee County, Georgia. We've visited her garden and she has all these species of hydrangeas in profusion! Yes, macrophyllas wilt pitifully in the afternoon sun – to avoid that we recommend morning sun only (i.e., in the afternoon we recommend they are shaded). However, especially in the northern states (and I think you’re in New Hampshire? ), I see them planted in full, all day sun (like in shopping center parking lots!). They wilt on hot sunny days, but don’t on cooler or cloudy days and people just live with it. In your northern climate you can get away with this, even though they wilt. I can confirm that even though the wilting is hard to watch, that you will get better flowering in this sunny location of yours. Note to Southerners: your hydrangea leaves will burn in afternoon sun – not only the plants, but the flowers too – avoid afternoon sun if you’re in the South. You asked about long-term damage and I have often wondered about that, but I see giant old plants in full sun on Cape Cod. They wilt during the hottest, sunniest days, but, like you said, they recover at night. To my eyes, there seems to be no long term damage from afternoon wilting. Thought, I hate to see it. If you can’t stand to look at it, then I suggest moving your plants into a shaded afternoon spot. Rust spots can appear on plants in too much sun (rust spots look a lot like cercospera, but cercospera usually appears in late summer). So if you’re seeing small brown spots on the leaves in early summer or high summer, that’s an indicator that they’re getting too much sun. Otherwise, if the leaves aren’t sun burning and the flowers aren’t sun burning, then the plants are fine! Like with all things hydrangea, the answer is complicated. But they’re worth it, I think! Hi Mariana! What good information! I have an oakleaf and three macrophylla in my yard. The macrophylla are blue and even turn a lovely purplish color after the blue . What I’ve noticed is that they wilt in the hot afternoon sun of deep summer so I probably should move them. They do revive overnight. Will it cause long term damage if I leave them where they are? It would be a lot of work to love them. Thank you!